Ok, I don't know how I never realized this before, but we don't have a truly dedicated book thread! Music, video games, movies, and tv, but no general book thread! There's the various Tolkien threads and then Song of Ice and Fire, but not general books. There we go, let the chaos begin! Above all I love a well written history. Anything by Mark Kurlansky ('Salt', 'the Big Oyster') is great. A recent study of Ghengis Khan by Jack Weatherford shows that far from being the bloodthirsty savage portrayed and propogated by terrified Europeans he could be described as an enlightened leader, even if completely ruthless to those that resisted him. Since coming to New York I've become interested in New York history, and especially love the pieces by Joseph Mitchell, who did in depth character studies of people he ran into on the streets of the 1930's and 40's. There's so many great stories about new york, and one of my recent favorites is "Island of Sin" about Theodore Roosevelt's attempt to clean up manhattan around 1900. It was estimated that at that time on average every adult male in Manhattan visited a prostitute once per week. But if the authors do their homework historical fiction is as good. I actually count Dumas as a perfect example: the Three Musketeers was set a couple hundred years before his time, yet captures the ambience perfectly - or at least I get the feeling it does. Modern authors often do as well. Too numerous to list, but I deeply appreciate a well researched historical novel. Shoddy journalism just doesn't cut it in publishing these days, even if 'real' journalism has largely deteriorated into quick internet searches and sensationalism. I read mostly Sci fi, with mainly reading Star Wars and Halo books. I did read Into Thin Air recently though (about '96 Everest disaster), quite good. On the quality front Im reading Hornblower right now, and on the lighter side I am rereading Pratchetts Equal Rights. I am reading the Hamish Macbeth murder mysteries. Its set in the highlands of Scotland and the hero is a tall slim red haired Scottish man who loves a dram, is highly intelligent, sensitive and loves his cat and dog more than most humans, he reminds me of someone, cant think who. Well cant be me Ive never solved a murder mystery. Well unless you count that time I discovered what happened to Pretty's first boyfriend, but I more stumbled into what remained of him. I thought she was referring to ffolkes. I'm about 125 pages into War and Peace. So I'm gonna be a while. ffolkes was a James Bond parody starring Roger Moore (though made up to look like Sean Connery) as a knitting, women hating, cat loving private security consultant hired by Lloyds of London to protect a set of oil derricks. I enjoyed it though the critics weren't so crazy about it. It was British made, so the parody had just the right tongue-in-cheek element to it, as opposed to American efforts such as the comic Casino Royale or Austin Powers. Roger Moore said he preferred it to any of his Bond movies. Got to say Ive never heard of it so had to look it up. Its listed as a 'thriller' on most sites. - presumably they thought Americians wouldnt know where the North Sea was so changed it to FFolkes. It was then renamed Assualt Force for US tv. Reminds me of that, probably aprochyphal story, about Sir John Gielgud trying to get a US distributer for Henry V and being told that "Americans aint going to go for the movie when they aint seen the first four." I think ffolkes is a better title. 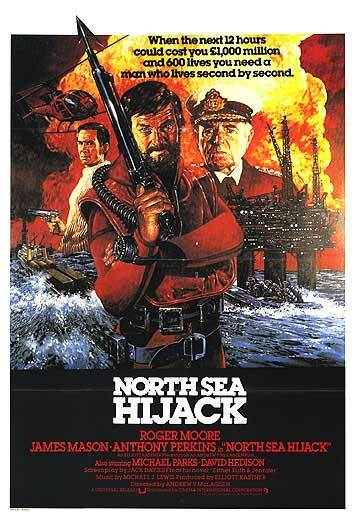 It got your attention in a way "North Sea Hijack" wouldn't have. btw, a running joke (presumably based on the reality of a real family with the name) is that it is properly spelled non-capitalized. And the reason it's billed as a 'thriller' is the humor is too subtle to get away calling it a comedy. It's all done dead-pan. I shall have to track it down. Lorient Avandi wrote: Ok, I don't know how I never realized this before, but we don't have a truly dedicated book thread! Music, video games, movies, and tv, but no general book thread! There's the various Tolkien threads and then Song of Ice and Fire, but not general books. hmm.. the hobbit? LOTR? Sherlock Holmes? the "what are you reading (or whatever it is called)"-thread? Ive loved books all my life, I had lots of lovely books,with beautiful illustrations, when I was a kid. Wish I still had them ! I enjoy reading Terry Pratchett over & over again, "Small Gods" was so funny, Hes got such a slicing sense of humor. I never find Pratchetts books boring, & when a new one comes out, I want to get it & read it asap. I love reading sarcastic wit. At the moment Im reading "Wilt" by Tom sharpe. Very funny story about a guy getting nowhere in his teaching profession, dreams of killing his wife,who hes tired of, does a Test run using a blow up doll, then his wife really does go missing & hes accused of murdering her. And Midnite, The Story of a Wild Colonial Boy - Randolf Stowe. Little known book but I think it's the best Australian novel for children of all ages of all time. Humour all it's own but in some ways has a The Hobbit quality. A keen eye for irony without ever being heavy handed at all, at all. Probably my second favorite book after The Hobbit. Also runs surprisingly deep at times (like The Hobbit). Hmm... I specifically mentioned that aside from the specific series thread, we didn't have a general books thread. I also looked throughout the Arts subforum before I made this thread to make sure. The "What are you reading" is 4 pages back in the off-topic subforum, where I didn't expect it to be. Anyways, what are you reading Norc? I managed to read Trude Teige's - Noen vet (Somebody knows) at easter. Crime novel. Not bad, the characters and all felt real. The backstory is dreadfully sad, especially since it's based on true stories. Even if I figured out a key element early on. I felt the ending was a bit rushed, but there are two more books in the series so I imagine that's where the reaction to the events will be found. the most irritating book I ever read was Captain Corellis Mandolin, I read the last chapter and threw it through the window, luckily it was open. one of the most mind boggling was probably His Dark Materials, (it doesnt take much to boggle my mind) they are the only books in my library that I cant read again, they were emotionally draining. which is weird for a kids book to do that to me. the nearest feeling to losing 'friends' when I finished the books were the Harry Potter books, I felt bereft, silly but true maybe it was my fragile state at the time. the books that have influenced and become part of my dna most LOTR natch. Worst book Ive read to date was "Angels & Demons" by Dan brown, what a load of shat ! "the Da Vinci code" was alright, & I thought A/D would be exciting....wrongo ! Bored me to sleep, I just couldnt be bothered to read the next line,but,somehow I did,to the end,.. never again !